Nothing about it is very exotic: berries, cream, flour, sugar, butter...universal ingredients. And it's one of the MOST DELICIOUS desserts in existence. Yet the authentic strawberry shortcake remains sequestered to the Southern United States. It takes many forms, most of them deviations from the authentic. You might see a cringe-worthy version up North, like this one, which is nothing more than sponge cake with (pre-whipped?) cream and (two?) strawberries. 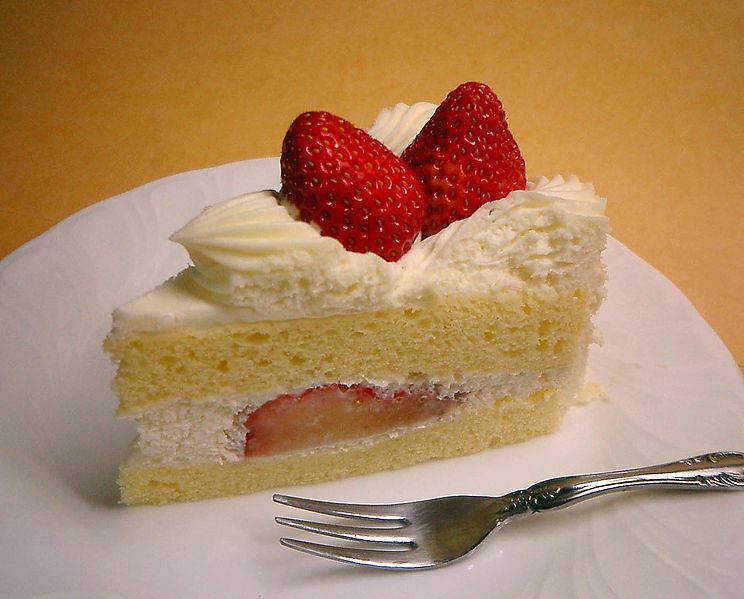 Shortcake refers to adding shortening or butter to a dough. "To shorten" is a term from the 1400s that means "to crumble easily". The dessert itself as a whole is first seen in print around the 1850s. We made it at the American baking course I gave in Beasain last week, but only a few of the students' doughs turned out well. Why? Well, cutting butter into flour (be it for scones, biscuits, or shortcakes) is notoriously difficult and delicate. Get the butter too warm, and your dessert will spread too much and lack a delicate, flaky texture. Work the flour too much, and the gluten will weigh down the dessert and make it heavy. The best method for cutting butter into dough is probably the food processor. Dice your butter, put it in the freezer while you get everything together (for good measure), then pulse a couple times in the food processor and there is no risk of body heat melting that precious butter. I've also heard of success with people freezing the butter then grating it, which results in butter that is a desirably small size with minimal handling. But you'll know you've made it in the baking world when you can succesfully cut butter in with your fingers. It's tough. The other key is, upon adding wet ingredients, using a delicate and quick stirring motion to combine the ingredients with as few strokes as possible. Combine strawberries and 1/2 cup sugar. Cover berry mixture, and let stand at least 1 hour. Whip cream. When it starts to gain body, add 2 TBSP of sugar, gradually, and then when soft peaks form beat in the liqueur. Cover and chill. Combine flour, remaining 1/4 cup sugar, and baking powder in a large bowl. Cut butter into flour mixture until crumbly (using either a food processor, two knives, pastry blender, grater or your hands). Whisk together eggs, sour cream, and vanilla until blended; add to flour mixture, stirring just until dry ingredients are moistened. Drop about 1/3 cup worth of dough in balls on baking sheet. Bake at 450° for 12 to 15 minutes or until golden. Once cooled, split shortcakes in half horizontally. Spoon some berry mixture onto each shortcake bottom; top each with a dollop of whipped cream, add a few more strawberries and cover with tops.